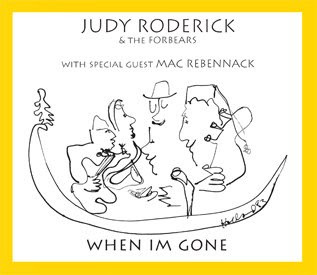 Jazz Station - Arnaldo DeSouteiro's Blog (Jazz, Bossa & Beyond): CD of the Day - "Judy Roderick: When IM Gone"
Finally, from early 1980's sessions, the Judy Roderick CD, 4 songs with the legendary Mac Rebennack (aka Dr. John) on piano & Hammond B-3. For those who remember the Judy Roderick & the Forbears cassette... this is the same set, remastered for Compact Disc, plus Judy's solo recording of "Floods" from 1976. Featuring: Dexter Payne (reeds), Don DeBacker (guitar), Washboard Chaz Leary (percussion), Tim Martin (bass). My personal favorite tracks: "(American) Money Blues", featuring a great Dexter Payne solo on alto sax, and an inspired reading of "Dream of You".